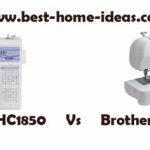 Brother HE-1 is an excellent entry level embroidery machine. But you can’t always consider it as a value for money option, just because there is a better machine from Brother itself. Brother HE-1 is an embroidery only machine. This machine has a striking similarity with the ever popular Brother SE400, except for the front graphics. 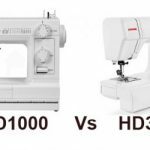 While SE400 is a sewing and embroidery combo machine, Brother HE-1 is an embroidery only machine. HE-1 has 70 built-in embroidery designs to choose from. It has 5 lettering fonts and 120 frame pattern combinations. You have large, small and medium alphabet sizes to choose from. You will have to play with the sizes to make it fit in the embroidery frame, especially if you are using long words. Brother HE-1 has a lot of advanced editing options. Reasonably sized LCD touch screen makes stitch selection and editing very easy. This should be a walk in the park for anyone using a basic smartphone. On board editing option is a huge blessing, as you will get a preview of what you be getting. Added to that, is the USB connectivity option to import thousands of designs from ibroidery.com or other websites. Creativity has no limit on this machine.Even impressive is the fact that how easy it is to transfer downloaded designs to the machine. It is exactly like copying a file to your flash drive. The embroidery area of HE-1 is 4″x4″, which clearly suggests that it aims entry level sewers (4″x4″ hoop is included). With the automatic needle threader, you can thread the needle in a snap. There is also an automatic thread cutter, which cuts the the remaining thread automatically. Top drop-in bobbin makes bobbin changing easy. Snap-on hoop is another user-friendly feature. On-screen help is available on Brother HE-1. So you don’t need to go after the user manual all the time. There is an independent bobbin winding motor which is pretty common on all modern machines. The main machine motor can deliver 400 stitches/min, which is powerful enough to handle most projects. The machine has a built-in accessory storage compartment. HE-1 has 25 year limited warranty cover. First you need to understand what Brother HE-1 is capable of. 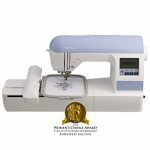 It is an entry level embroidery machine and the embroidery area is 4″x4″, which can only handle small to medium sized projects. 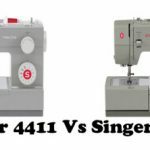 If you are looking to work on large projects you will have to rely on machines with larger embroidery area like the Brother PE770 or Singer Futura XL-400. The stitch quality of HE-1 is very impressive. The controls and editing is very easy to understand. It is a very user-friendly machine, something which beginners will love the most. Performance and quality of this machine is top notch. There aren’t many negatives to point out. But the small hoop size is a drawback. Everything goes well except the price. I feel that Brother HE-1 is slightly over priced, especially when you can get Brother SE400 for more or less the same price (sometimes even cheaper). As I have said earlier, HE-1 is just an embroidery machine. Now suppose, if you can get HE-1 and a regular sewing machine combined for the price of HE-1, wouldn’t that be a better deal. That is exactly what you will get with SE400. 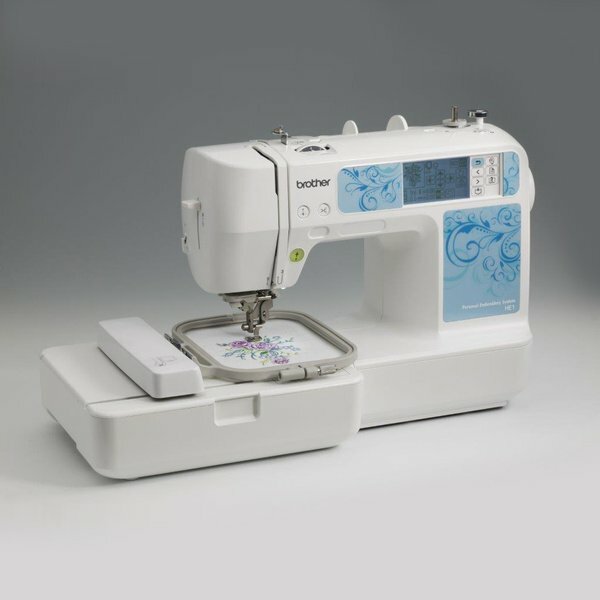 SE400 has all the embroidery features of HE-1, plus the sewing features like 67 built-in stitches, 10 one-step buttonholes, programmable needle up/down, sewing speed control slider etc. This makes Brother SE400 more value for money than HE-1, especially when both machines fall in the same price band. 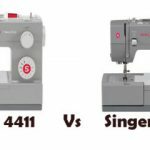 Moreover SE400 is the most sold beginner embroidery machine in US, which gives you some idea about its quality. So compare the prices before you make a decision.